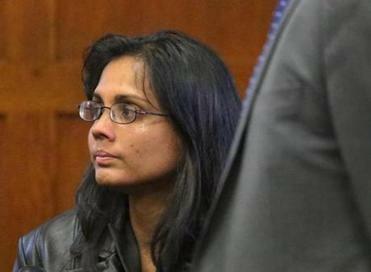 Annie Dookhan, the drug analyst who tampered with evidence and jeopardized tens of thousands of criminal convictions, was sentenced Friday to three to five years in state prison, closing a sorrowful chapter for the woman at the center of a scandal that continues to plague the state’s criminal justice system. The 36-year-old mother of a disabled child, whose marriage fell apart in the months after the scandal, softly pleaded guilty to 27 counts of misleading investigators, filing false reports, and tampering with evidence. She must also serve two years of probation and undergo mental health counseling, if needed. After the sentence was handed down, Dookhan struggled to hold back tears as she whispered with her lawyer before being led away in handcuffs by court officers. Two family members, believed to be her parents, watched from the courtroom gallery. Attorney General Martha Coakley, whose office prosecuted the case, said in an interview later that the conviction of Dookhan was only one part of an ongoing investigation into the quality of drug testing at the Hinton drug lab, but she said it was needed to bring some accountability for her crimes. A tear ran down Annie Dookhan’s cheek during the court hearing. State Representative Bradley H. Jones Jr., the House Republican leader, expressed disappointment with the sentence. Developments in the scandal went beyond Dookhan’s plea and sentencing. The Globe learned Friday night that State Police have fired a drug analyst who worked with Dookhan at the lab when it was run by the Department of Public Health. The former analyst, Kate A. Corbett, was fired for allegedly falsely claiming in court testimony that she had a bachelor’s degree in chemistry, according to a source familiar with the investigation who was not authorized to speak publicly. David Procopio, a spokesman for the State Police, would only say that the analyst — he did not identify Corbett by name — was fired after State Police took over the lab and began reviewing employees. He said investigators found discrepancies in what she stated about her academic record, and the discrepancies have been referred to prosecutors and defense attorneys already involved in the Dookhan scandal. 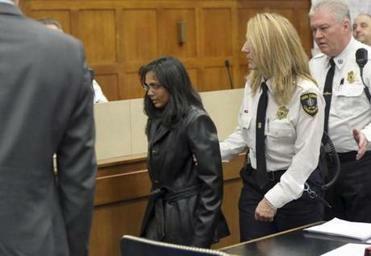 Dookhan was led away by a court officer on Friday after the hearing in Suffolk Superior Court. By August, a year after the extent of Dookhan’s crimes were first discovered, a Globe review of court records showed that more than 600 defendants had convictions against them erased or temporarily set aside, or they have been released on bail pending new trials. Of those, at least 83 defendants — about 13 percent of the total — had been arrested and charged with other crimes. In one case, a Brockton man released from prison last fall because Dookhan was involved in his case was arrested for allegedly killing a man in a drug dispute in May. Cape & Islands District Attorney Michael O’Keefe said that the lab scandal has burdened district attorneys and the courts. At times, the courts have had to release prisoners or grant them new trials “in the interests of fair justice,” he said. “It’s something that we’re going to be trying to correct for quite a period of time,” O’Keefe said. But he and defense lawyers also agreed that the woes will not end with Dookhan’s sentence. Defense lawyers have called on the state Trial Court to set up an independent special court system to review evidence that was handled not only by Dookhan, but by anyone from the Hinton laboratory. The lab, which was closed by State Police in 2012, handled more than 190,000 cases since the early 1990s. The state Office of Inspector General is also conducting an independent probe to determine whether the laboratory followed its own policies and whether those policies met national standards, said Jack Meyers, a spokesman. “The chapter in Annie Dookhan’s life is over, but the story goes on for the thousands of individuals who have been affected by her conduct, by the conditions of the lab, and by the effect that it has had on the criminal justice system as a whole,” said Anthony J. Benedetti, chief counsel for the Committee for Public Counsel Services, which represents poor clients, and represented the majority of the Dookhan-related defendants. Michael Levenson of the Globe staff contributed to this report. Milton J. Valencia can be reached at mvalencia@globe .com. Follow him on Twitter @miltonvalencia.